A team from the renowned television show, Deep Sea Detectives, are in San Pedro and want to be the first to document a dive to the bottom of the world famous Blue Hole off the coast of Belize. The expedition is organized by the veteran divers John Chatterton, Richie Kohler and videographer Evan Kovac. The team has spent years documenting deep sea shipwrecks and has produced the television shows for the History Channel. They are documenting their descent into the Blue Hole for the History Channel and for a DVD Dive magazine filled with extreme diving. 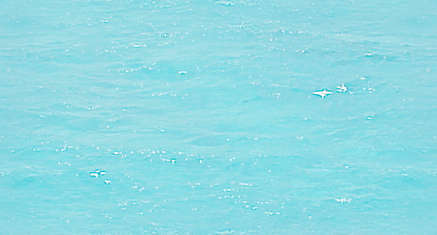 When asked by The San Pedro Sun, “Why the Blue Hole?” Kohler replies, “because it’s there.” He added that the beauty and reputation of the Blue Hole were key factors for choosing this site. The fact that it is becoming so well known, yet no one has documented reaching the bottom were reasons for coming to Belize. There are rumors that Jacques Cousteau may have made it to the bottom in a mini submarine, but no proof has surfaced to substantiate this rumor. No one knows how deep the hole is for certain. The team is prepared to go as deep as 500 feet. They are hoping that the bottom will be around 475 feet. The team made their first attempt on Tuesday. While descending to about 300 feet, a buoyancy chamber attached to the underwater housing that contained the high definition video camera imploded under the pressure. “It was like an explosion,” said Chatterton. Cameraman Kovac said the chamber was made from PVC pipe and a piece of shrapnel nearly hit him when it exploded. After the incident the camera was much heavier, forcing the cameraman to paddle and breath too quickly for the re-breather equipment to compensate. As a result, they decided to abort the mission and regroup to try it again another day. 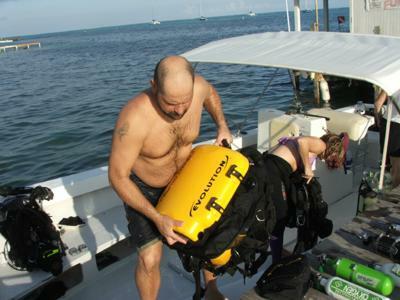 Diving to these depths requires much more sophisticated equipment than the regular recreational diver will use. 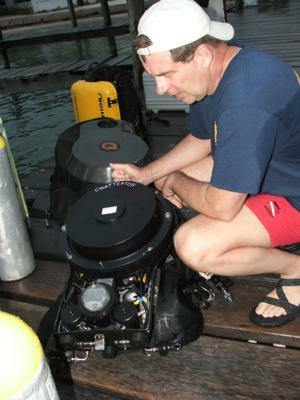 The space-age equipment includes a device that takes the exhaled air from the divers, cleans and analyses it using onboard computers and allows the divers to reuse the air and continue diving. The air mixture is largely helium which reduces the risk of contracting the bends and also reduces the amount of time necessary to decompress. Chatterton and Kohler have been working and diving together for years. Together they have produced 50 episodes of Deep Sea Detectives. The book Shadow Divers documented their investigation of a World War II German U-boat that they explored 60 miles off the coast of New Jersey in the Atlantic. The team have been working with Peter Jones and the good people of Protech while staying in San Pedro.